Orthodox Jews will be demonstrating today, October 11, outside the Toronto Center of Art, 5040 Yonge Street, Toronto, at 6 PM. TORONTO, CANADA, October 11, 2018 /EINPresswire.com/ -- Orthodox Jews from the anti-Zionist Jewish community of Canada will be demonstrating today, October 11, outside the Toronto Center of Art, 5040 Yonge Street, Toronto, at 6 PM. 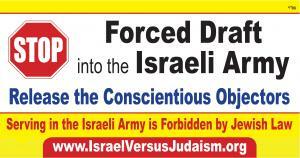 The group will be conveying the message that the Israeli Defense Force [IDF] is not in favor of the Jewish people. “The IDF is a destructive force to the Jewish people and to the Jewish nation”, Said Rabbi Aron Jacobowitz, a spokesman for the demonstration. "We will be bringing to the attention of the attendees that Judaism and Zionism, the Jewish people and the State of Israel, are not one and the same, in fact they are diametrically opposed. 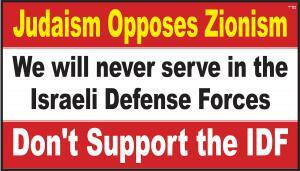 "Judaism is a religion of serving the Almighty, while Zionism is a political movement of nationalism. For centuries Jewish people lived in the Holy Land with the only goal of practicing their religion and living in total peace with their neighbors. "In fact, according to Jewish belief, Jews are in a Divinely decreed exile and are forbidden to create their own State or to provoke against nations. We are forbidden to wage wars against any nation or to shed blood. "In addition to all it has done to other nations, which is in total violation of Judaism and opposed by masses of Jews worldwide, the State of Israel recently attempts to force religious Jewish youths to physically take part in all its criminal acts and to assimilate them into the Zionist secular society. Whoever refuses to join them, or stands up to protest, are brutalized, harassed and imprisoned. "By attempting to force our communities to serve in the IDF, the Israeli government is trampling on our religious rights. By oppressing non-violent protestors, they are trampling on our freedom of speech. "When the state of Israel professes to act in the name of the Jewish people, it is exacerbating anti-Semitism, causing harm, hate and conflict amongst so many Peoples. "This is one more link in the long chain of systematically uprooting our religion. They did so originally with the Jews of Yemen, Tunisia, and the rest of the Middle East and now they attempt to do so with the remnants of the God-fearing communities in the Holy Land. "It is criminal when these people call themselves Jewish, supposedly representing the entire Jewish people and it is hypocritical when they misuse the Jewish religion for their benefit. They do this all to mislead good hearted philanthropists, into supporting their movement. Also to stifle opposition, who are fearful of being accused of anti-Semitism "